AHWAZ NEWS International intifada "Al-Ahwaz will be next battle after Syria"
Relations between the opposition to Syria's Assad regime and the Ahwazi Arabs are growing with both forging bonds to fight their common enemy, the Iranian regime. With Iran now in effective control over its Syrian vassal state, the Syrian opposition have pledged to support the Ahwazi struggle in meetings with senior Ahwazi leaders. A company of the Free Syria Army's Dere'a Al-Jazeera in Al-Mayadin has named itself the 'Al-Ahwaz Brigade' in solidarity with the Ahwazi intifada in Iran. They were instrumental in recently liberating the area from the Iranian-backed Assad regime. Meanwhile, there have been top-level discussions between the leaders of the Arab Struggle Movement for the Liberation of Al-Ahwaz and the Syrian Muslim Brotherhood. 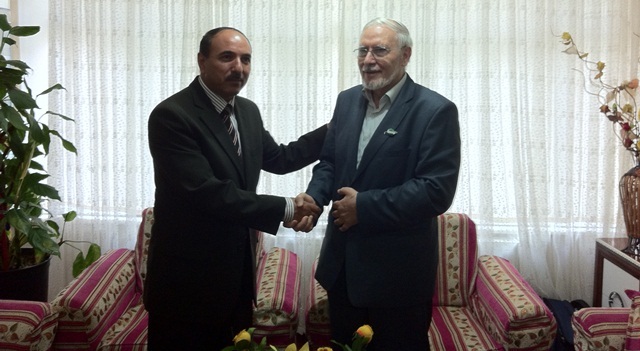 In September, ASMLA leaders met with Brotherhood Comptroller General Mohammad Riad al-Shaqfeh in Syria. Both groups accused Iran of sowing sectarian strife in the Arab world and acting like a colonial power. ASMLA described its formal contacts with the Brotherhood as a "quantum leap in strengthening the relationship between the Ahwazi and Syrian revolutions" that would enable them to "work together to overthrow the existing alliance of the regime of Bashar al-Assad and the Iranian regime, which continue to spill the blood of Arabs in Syria and Ahwaz." Syria had been a safe-haven for Ahwazi Arab refugees until Bashar al-Assad forged closer alliances with Tehran. On Iranian orders, Assad forcibly refouled several UNHCR-mandated Ahwazi refugees living in Damascus, including Faleh Abdullah al-Mansouri, the leader of the Ahwaz Liberation Organisation who now has Dutch citizenship. Assad ignored UNHCR statements that such actions were in contravention of international humanitarian law. Syrian human rights campaigners frequently condemned the deportations, while Persian-led "opposition" groups have failed to voice any protest. Before the Syrian uprising, the Ahwazi community in Damascus was living in fear, but is now fully behind the revolutionary struggle. 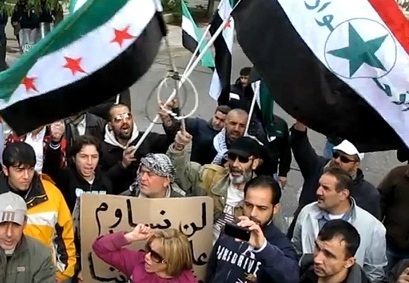 There have been frequent demonstrations in Syria by Ahwazi Arabs flying the opposition flag alongside their own. 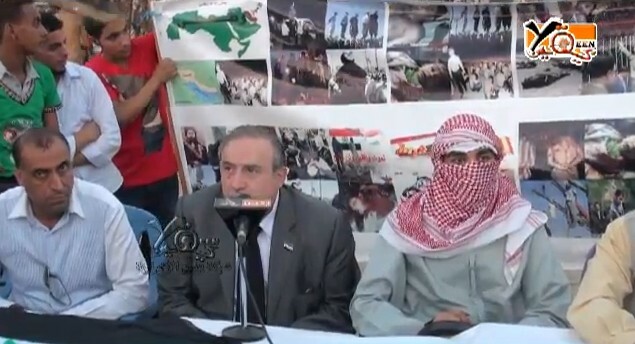 "Al-Ahwaz will be the next battle"
The Ahwazi struggle is attracting support from across the Arab world. In August, members of Egypt's Coalition for the January 25 Coalition held a demonstration in Cairo's Tahrir Square in support of the Ahwazi intifada. Palestinian, Egyptian, Syrian, Iraqi and Ahwazi demonstrators condemned the "represssive policies practiced by the Iranian authorities against the Arab people in Ahwaz" and called for independence for Al-Ahwaz. 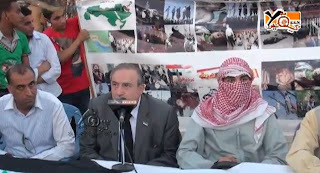 A press conference at the event was addressed by former Syrian opposition MP Mohamed Mamoun Homsi who voiced solidarity for the Ahwazi Arabs' struggle for self-determination, which he stated was a legitimate demand under international law. Homsi warned the Iranian regime that the struggle of the Ahwazis against injustice and oppression would be the next battle following the overthrow of the Syrian regime. Ahwazi Arab groups have urged the international community to consider Libya-style multilateral military action to remove the Iranian regime. In an opinion survey conducted by the Ahwazi Arab Solidarity Network (AASN) leading Ahwazi parties and activists were unanimously opposed to an Israeli strike on Iranian nuclear facilities, but warned that sanctions will not be enough to encourage the regime to abide by its obligations under the Non-Proliferation Treaty (NPT) and in accordance with UN resolutions. Only multilateral military intervention aimed at overthrowing the oppressive, terrorist-sponsoring regime will prevent the acquisition of nuclear weapons, said the respondents who urged Western governments to work with them towards democratisation.